Ninja Sword or Ninjato has different names. It is also called shinobigatana, ninja-ken or ninja-to or shinobi-ken. It is mostly known as the sword traditionally used by the Ninja. Unlike Katana Sword Ninja Sword is straight and short-cut. Its straight blade has a square guard. The square guard of the Ninja sword is called tsuba, and the sabbard is knife-edged at the end being longer than the sword itself. The Sageo cord is commonly used to secure the sword. 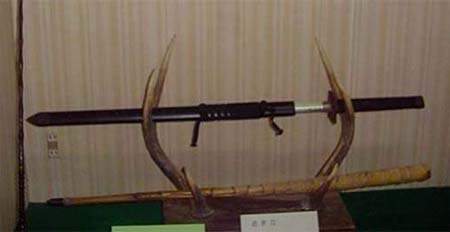 Using long Sageo, it is easy to customize the weapon. 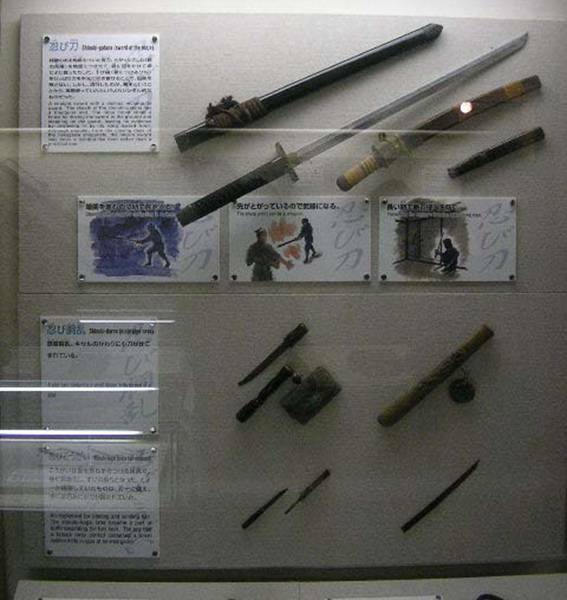 The sword traditionally used by the Ninja is shorter than the Samurai sword, though the aspiration to have sophisticated and multifunctional weapon for universal purposes ended in originating Ninjato. The sword was made of carbon steel of a little bit inferior quality that that of Samurai. The reason of such quality is that Ninja used their swords rather as spears unlike Samurais who used to swing swords and slash enemies. The blade of Ninjato is weaker but easier to use. Since the scabbard was longer than the blade, the lower chamber contained the hidden compartment to keep stolen documents and various accessories traditionally used by the warriors of shadow as spikes, small amounts of poison, daggers. The tip of the scabbard that come off was used as a snorkel when spying or as a band trunk called fukiya. A square guard (tsuba) was used for particular purposes; mostly it used to serve as a step when passing onto the walls, fences and other barriers. The Bansen Shukai (The Ninjutsu Encyclopedia) describes seven types of application of the long Sageo cord. There was a myth created in course of shoting Hollywood movies about Ninja and existed for long time that Ninja acted overnight only. That is not like that. They were involved in a plenty of secret tasks when they had to pretend being merchants or Samurais. Such characters required being perfect in precise details not to be caught. And herewith the Ninja sword was of greater value and use. In the palmy days of Samurai and Ninja clans various weapons were on the run apart from skillfully curved swords. Many engravings depicted Samurais fighting with the straight swords and they were used with a vengeance as well as the curved ones. Whether to use this or that kind of sword depended on the warrior, his preferences and habits. No certain requirements were observed in regards to the type, shape and length of the sword. There were certain rules on how to carry the sword though holding the sword in hands or behind the back was not suspicious at all. And, thus, the straight sword with the square tsuba in the belt or behind somebody’s back did not attract attention. Weapon was not worshipped in Ninjutsu as compared with that in the world of Samurai; the types of weapon were only means to help performing various tasks. A sword was sometimes used to be thrown in face of the opponent to gain some time for hiding and the proficient Shinobi warrior needed a short time to get escaped. Shinobi-no-mono in Ninjutsu stood for “to steal away” or “professional in the art of stealth”. The principles of Ninja art to steal away was sophisticated by time to stand against Samurais and the Ninja sword was one of the weapons to help them do that.